The Bancroft chapter of the Ontario Woodlot Association had its biggest turnout ever last Saturday at its annual general meeting last Saturday. 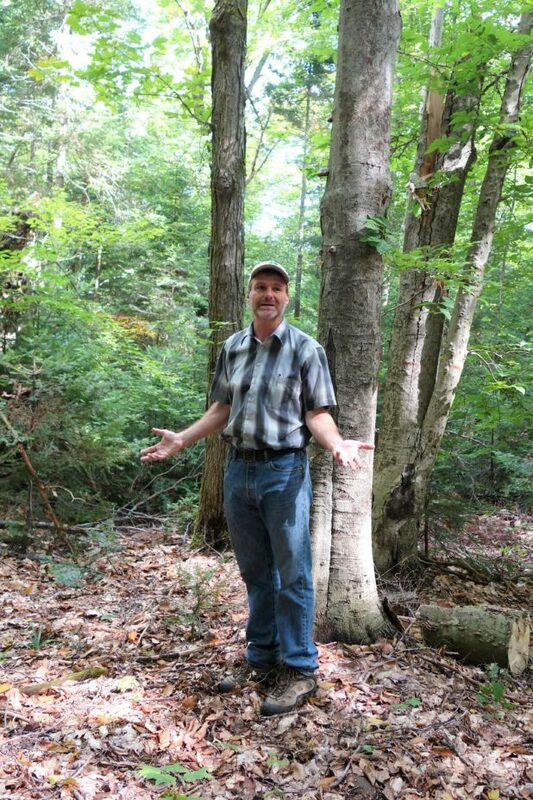 More than 30 members gathered at a private woodlot on the outskirts of Bancroft off Airport Road to take in a presentation by Ernie Demuth of Demuth Forestry Services on the impact of Beech Bark Disease on Ontario’s forests and forestry industry. Having first reared its head in Canada back in the 1890s in Nova Scotia, Demuth said BBD has since migrated to Ontario, mainly through the transport of wood and wood products. Noting the importance of the forestry industry to the local economy, he said North Hastings is a BBD hotspot. As devastating as the emerald ash borer has been in Ontario, Demuth said BBD will likely have a much larger impact on the forests of Ontario. “We experience it much more severely,” said Demuth. “In the killing front, that’s when you get really heavy, extensive above ground mortality, and it can’t be overtaken,” said Demuth. Recognizing the dangerous predicament BBD creates for the forestry industry, Demuth said it is also bad news for biodiversity. Because BBD also reduces the beechnut production part of infected trees, he said it can also limit the contribution of beechnuts to a local ecosystem which is a primary food source for many species of wildlife in the forest. Limiting this food source creates an imbalance in the forest, and a significant problem for the black bear in particular. Acknowledging that beechnuts (11 per cent) have a much higher fat content than acorns (six per cent), Demuth said black bears consume a large amount of them to fatten up and ensure their survival over winter. “There have been studies that have shown, that 80 per cent of sows reproduce better after a good mast year, so when they get a lot of beechnuts they have good reproduction rates,” Demuth said. Demuth said on occasion in forests affected by BBD, an isolated mature tree will not exhibit any symptoms. Demuth also indicated that these resistant and tolerant trees are currently being studied and can be conserved to maintain tree species diversity throughout the forest. According to Demuth, there are basically two types of treatment that can be employed to help prevent BBD from spreading further throughout the forest – these being manual and chemical. He explained that manual treatment entails using a brush saw to cut down beech trees that are less than two inches in diameter; and girdling the stems of trees that are two inches to eight inches in diameter using a hacksaw, axe or flame torch. Goats can also be used to go beech trees of this size, however, he said this often results in small stems re-sprouting from the damaged roots of larger beech trees. Allowing for an organic control option, Demuth said brush saw treatment is the most feasible for smaller areas because it is more cost-effective. He also pointed out that Québec is treating BBD manually without chemicals and it is working well. In terms of chemical treatments, Demuth said there are three main options – basal bark treatment, cut-stump treatments, and stem injection/hack and squirt. Using a chemical called triclopyr, he said basal bark treatment usually works well on infected beech trees less than six inches in diameter. Barbara Szita-Knight is the communications director for the Bancroft chapter of the OWA. After sitting in on the session, she described it as both educational and overwhelming. She said Demuth’s report was “fair and balanced,” and that he did a great job in a short period of time describing and relaying the mechanics of the attacking organisms, and best procedures for managing BBD. “The woodlot walk was quite the eye-opener as to the wide scope and physical appearance of diseased trees, and a fundamental tool in fully understanding what the beech tree species is up against,” said Szita-Knight. For more information on beech bark disease and the Bancroft chapter of the Ontario Woodlot Association, visit their website at www.ontariowoodlot.com.